I hadn’t read anything by Wesley Chu before, but I’ve heard extravagant praise for the Lives of Tao series, so I was looking forward to it. 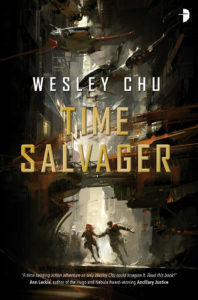 Unfortunately, I didn’t think Time Salvager was very good – it had a great premise, but the writing was clunky, the plot is riddled with clichés and the characters seemed more like archetypes than people. It’s the 26th century, and humanity is in danger of extinction due to centuries of war and resource limitations. The only thing keeping humanity going are the chronmen, who take difficult excursions into the past and salvage material for present day rebuilding. James Griffin-Mars is a chronman who gets a “golden ticket” job offer, accelerating his retirement considerably. However, on his way back, he breaks the cardinal Time Law, bringing a doomed scientist, Elise Kim back with him, and now they’re both fugitives. Like I said, the premise of this book is interesting – time travel as a way to gather resources. What it actually ended up being was a mostly a lot of different action scenes with a clichéd evil corporation as the villain. There are a few forays into various historical periods, but they’re sparse on detail and atmosphere – in fact, the whole world it builds doesn’t seem compelling at all. Some of the lack of color makes sense with the whole “humanity is desperate” thing, but how desperate can humanity be with roving spaceship malls being commonplace? None of the characters were engaging either, their decisions didn’t make any sense, and they seemed like a bunch of stereotypes thrown together – for example, the protagonist James is going somewhat crazy (complete with hallucinations of people whose lives he didn’t save), he likes Elise Kim, and I don’t know anything else about him. I can’t describe him as brave or determined or pretty much anything, he’s just someone who feels and thinks what the plot needs him to. Every other character has the same flaws, any attributes they have are just described by the text, not shown. The book isn’t even self-contained – it’s clear setup for a trilogy, it raises a bunch of questions and answers none of them, and since the entire book has been fighting and running, the climactic fight doesn’t even seem much different from the rest of the book. I’m not sure how this book got so many glowing blurbs, I don’t think I’ll be reading any more of this series.